Very Severe Cyclonic Storm has weakened (Estimated Average 985 mb) and now currently located at 16.1N and 69.5E, meaning it has moved NE. Core wind speed estimated at 100 kmph. Now, as explained, it is encountering wind shear and cold dry air envolopment, thus weakening it further on Tuesday. 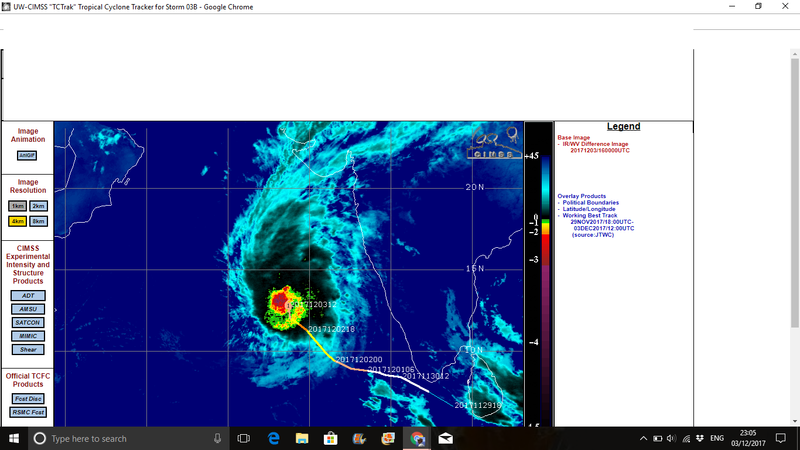 Expected to make landfall as a low around Gulf of Khambhat by 6th morning as a Low. Rainfall has commenced on Monday evening in parts of Saurashtra. North Konkan including Mumbai has been receiving light to moderate rains since Monday evening. Mumbai: The Ockhi effect : Light to moderate rain over Mumbai on Monday evening. Colaba 13 mms and Scruz 11 mms till 11.30 pm IST. Monday. (Expected 5-10 mms on Monday evening). Tuesday 5th will get Light to moderate rains, and a heavy shower possible in some areas. Windy with gusts upto 35-40 kmph. Rainfall from Tuesday morning to Wednesday morning (8.30 am) around 25-30 mms. Day cool around 26c. Rains decrease from Wednesday. Ahmadabad: Tuesday will be cloudy and with occasional showers, with a heavy shower possible. Around 30 mms rains likely. Heavy falls expected in parts of Eastern Saurahtra. BB-19 likely to become a Depression by Tuesday. Later, strengthen more and track towards North T.N. coast. Approaching the coast around Thursday 7th. Tracking Northwards now, latest location at 13.5N and 68.7E. Wind speed estimated at 130 kmph and core pressure 977 mb estimated average. As explained earlier, the cold dry air is now almost encircling the Very Severe Cyclone from the West and south. Hence, with the positioning of the STR, the Cyclone has now tracked N, changed course along expected lines. As explained earlier, the cold dry air is now almost encircling the Very Severe Cyclone from the West, south and South-East (New). Hence, with the positioning of the STR, the Cyclone has now tracked N, changed course. "Ockhi now likely to curve NE from late Sunday night. Pronounced weakening from Monday. System might rapidly weaken due to cold air and increasing vertical wind shear. Core wind speeds will be 120 kmph by Monday morning. Likely to strike land as a Low between Dahanu and Surat coast by Tuesday 5th. Light to moderate rainfall likely in parts of Saurashtra on Monday. Rainfall will be moderate in Saurashtra and South Gujarat on Tuesday. Moderate rainfall likely in North Konkan on Tuesday.Heavy falls in localised patches. Mumbai: Light to medium rainfall likely in Mumbai City and Outer townships on Monday evening and Tuesday. (Around 5-10 mms). Very windy weather on Tuesday.Cool day at 26c on Tuesday/Wednesday. Pune: Cloudy weather on Monday with light rains in parts of city. Clearing by Tuesday evening. Rise in night temperatures on Monday and Tuesday, dropping from Wednesday. Ahmadabad: Cloudy on Monday.light rains in evening. Heavy showers on Tuesday (around 40-50 mms). Day will be cool on Tuesday at around 22-24c. Surat: Cloudy Monday, and rains on Tuesday. Around 20 mms rainfall expected on Tuesday. Very windy on Tuesday. Moderate rains in Saurashtra (Rajkot will be cold in the day at 22/24c) on Monday and Tuesday. BB-19 is now a Well Marked Low in the Southern Bay. Likely to become a Depression by Monday and track West....shall start chasing this system. Heading for North TN/A.P. coast. "Likely to strike land as a Low between Dahanu and Surat coast by Tuesday 5th." Only few days back, knowing this weakening trend, I had mentioned "if it strikes land". MAHA/GUJ has received rains every month since may 2017. Guess now we have December rains after length and excess SWM ! Rajesh sor,Nagothane would witness how much rains? As forecasted monday evening and it has started raining here @ khar west mumbai started arrd 6 20 pm. we already got over 10mm rains in many parts. time to update forecast? Navi Mumbai - heavy rains! Hardly a month has passed with great difficulty SWM with excess rains stopped over GUJ/MAHA. And now GUJ/MAHA is getting share of NEM also. Look like entire SAP (Rayalseema,chitoor,Ananthapur - will end with serious drought) - same with Sri Lanka, TN interiors. Position, topology of GUJ is so good it is like extended hands - receives AS lows, Bay lows at receiving end. Sir, heavy rains now in Goregaon! Heavy rains in belapur/navi mumbai - looks like july/aug! Horizontal extended coast line of GUJ flavors all lows/cyclones. Rajesh, this Ockhi is incredible. Against all odds it is fighting dry cold air and still coming over to make a landfall as a weak depression. Truly a Vagary of Weather indeed. Looks like Mumbai is developing 2 monsoons now : SWM and NEM !!! Just shows how unpredictable Nature could and we are just a speck in front of it. Always a humbling experience. But hope that it does not affect people or property much more . The latest ENSO Wrap-Up and Climate Model Summary are now available on the Bureau's website. up-to-date information on the likelihood of an El Niño or La Niña developing. The Bureau’s ENSO Outlook has been raised to LA NIÑA, indicating that the tropical Pacific has reached La Niña levels. Climate models suggest this La Niña will be weak and short-lived, persisting until early southern autumn 2018. Signs of La Niña in the equatorial Pacific have increased during spring. The central to eastern tropical Pacific Ocean has cooled steadily since late winter, and is now at La Niña thresholds (0.8 °C below average). Atmospheric indicators, including the Southern Oscillation Index (SOI), trade winds and cloud patterns, also show clear La Niña signals. In order for 2017–18 to be classed as a La Niña year, the event needs to last for at least 3 months. Climate models surveyed by the Bureau suggest that while this event is likely to persist over the southern summer, it will be weaker than the strong La Nina of 2010–12. La Niña typically brings above-average rainfall to eastern Australia during late spring and summer. However, sea surface temperature patterns in the Indian Ocean and closer to Australia are not typical of a La Niña event, reducing the likelihood of widespread above-average summer rainfall. La Niña can also increase the chance of prolonged warm spells for southeast Australia. The Indian Ocean Dipole (IOD) is currently neutral. IOD events are typically unable to form between December and April. Complete dark Navi Mumbai -torrential storm in place!